Born and raised in Norristown, educated in Norristown public schools, married to Mary Ann (Tornetta), parents of four children: John, Gregory, Suzanne and Stephanie (Stein) and fourteen grandchildren. Family activities. Historian, authoring numerous articles and publications. Collector of Norristown area memorabilia. 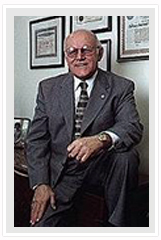 The Basile name has been synonymous with commercial real estate for well over three decades. Various corporate and professional affiliations have provided our principle, and subsequently our associates with the common sense know how hat has become our corporate trademark. Vice President & General Manager of the Norris Hills Court Apartment complex, New Hope Street and Johnson Highway, Norristown, PA. 231 garden apartments, with swimming pool. Leasing and managing agent for the Commonwealth Office Complex on New Hope Street at Johnson Highway in the Norris Hills section of Norristown, PA. Involving four, three story office buildings, and a strip shopping center. Vice President and General Manager of the Plymouth Towne Apartment complex, a residential community of 165 garden apartments, situated at Fairfield Road, just south of New Hope Street in Plymouth Township, PA.
Vice President and Partner of Tornetta Realty Corp. Responsible for advertising, public relations and commercial, office and industrial sales and leasing. Exclusive leasing and managing agent of the West Norriton Industrial Park, Germantown Pike and Trooper Road, East and West Norriton Townships, PA. Exclusive leasing and managing agent of the Colebrookdale Industrial Park, W. Colebrookdale Township, PA. Exclusive leasing and managing agent of the Parkerford Industrial Park, Route 724 at Wells Road, Parkerford, PA. Managed the octagon shaped building on the Parkway at 22nd Street, Philadelphia, PA., formerly known as The Plaza. This twenty-eight-story building was an 850-unit luxury apartment residence with bank branch, restaurant, swimming pool and a five tier underground parking garage. Simultaneously managed the exclusive Gypsy Lane Condominiums on Gypsy Lane, just east of Wissahickon Drive in Philadelphia, PA. A luxury condo community, with 325 residences, swimming pool, health club and manned security entry gate. Managing Agent for Cedarbrook Hill Apartments, Wyncote, PA. Approximately 1,000 luxury apartments in three high rise apartment buildings, with country club, 18 hole golf course and Cedarbrook Mall Shopping Center. While Associated With Anglo American Properties, Inc.
Anglo American Properties, Inc., a real estate investment firm headquartered in Great Britian, New York City and Biloxi, Mississippi. Responsibilities included management of thirteen garden apartment complexes in Pennsylvania, New Jersey and Deleware. A total of 3,000 apartment units with 45 employees.